Liberate Artists & Allegra Dance Greenwich are proud to announce that internationally renowned dancer and choreographer Sean “FRESH” Redding will be coming to Connecticut for a day of intensives. 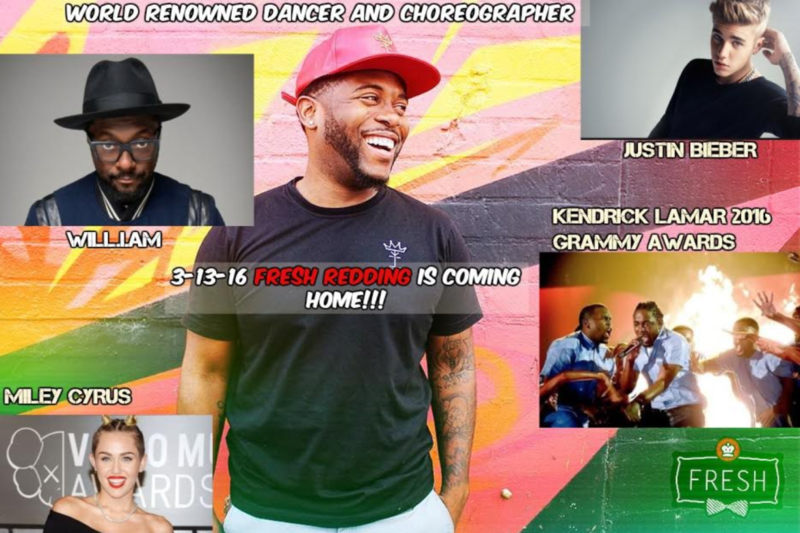 On March 13th 2016 dancers from all communities in Connecticut are invited to attend this homecoming class of one of the hottest choreographers from Los Angeles, FRESH! Justin Bieber, Lloyd, 50 Cent, Busta Rhymes, Keri Hilson as well as numerous appearances in commercials and TV shows such as Nike, Allstate , Fed Ex, Billboard Awards, The Ellen Show, Dancing With The Stars, and many more. On March 13th 2016, Liberate Artists will fly in guest master teacher, Fresh Redding, from Los Angeles straight to Allegra Dance Greenwich in Connecticut.This day of master classes, for ages 9 thru 20 will also include a talk back and photo op with the one and only FRESH. To reserve a spot, please email allegradancegreenwich@gmail.com and feel free to give us a call anytime at (858)-880-7354. Open to dancers of all levels and ages. Liberate Artists LLC provides In-House Conventions and dance, theatre, and music educators. Our In-House Conventions feature dancers & choreographers from So You Think You Can Dance, Dance Moms TM and Broadway. As well as performers who have danced and choreographed with companies Complexions Contemporary Ballet, Rasta Thomas’ Bad Boys of Dance, Cirque du Soleil, The Joffrey Ballet and have worked with artists Beyoncé, Madonna & Cher. To book one of our In-House Conventions or Master Teachers at your location contact us at 858-880-7354, or email us at info@LiberateArtists.com. For more information on Liberate Artists please visit our website www.LiberateArtists.com.